Getting around in Kochi is a hassle these days owing to traffic congestion and roadblocks. However, a solution is soon in sight with construction of the proposed Vytilla Mobility Hub underway. It is a state-of-the-art transportation system, being executed under the Vyttila Mobility Hub Society, constituted by the government of Kerala. 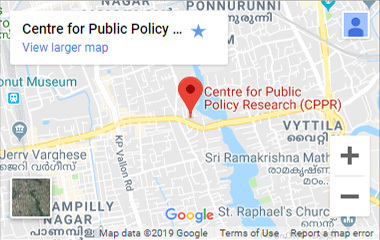 Centre for Public Policy Research (CPPR) undertook the research and prepared a plan for the hub. The primary aim of the project is to set up a modern mobility hub at Vytilla so that long distance buses do not have to enter Kochi city. Being constructed on 26 acres of land, the hub is envisioned as a long-term solution to the city’s transportation problems, by providing connectivity with the western and eastern parts of the city, West Kochi, and also regional hubs like Vypeen, Palarivattom, Kakkanad, Tripunithura and Aroor. With operations at the Vyttila bus terminal, KSRTC and private buses would not have to enter the city, thus saving on fuel and time. Inauguration of the first phase of work took place on February 26, 2011. Speaking at the function, Fisheries and Registration Minister S Sarma said the state government will soon sign a memorandum of understanding (MOU) with a group of banks to mobilize funds for the second phase of the project. The efforts to get funds from the Jawaharlal Nehru National Urban Renewal Mission (JNNURM) scheme will continue, he said. “Around Rs 376 crore is required for the second phase of the project. In case the JNNURM fund is not allocated, we cannot afford to lose the project. So we will be making parallel efforts to raise funds,” Sarma said. The hub is especially sensitive not only to pure transport efficiency but equally to matters of sustainable development, pollution and environmental impacts, says the Vyttila Mobility Hub Society. It offers social, economic and cultural benefits to the State. It is a place of connectivity, where different modes of transit, from walking to metro, come together seamlessly; a place in the urban region where there is an attractive, intensive concentration of employment, living, shopping and enjoyment around a transit interchange; easily accessible for those who begin or end their trip on foot or riding bicycles; a place where the transit rider is treated like a coveted consumer, with choices about how he or she moves around the region; a safe, convenient, attractive place where the city interacts with its transit system. According to the Vyttila Mobility Hub Society, in order to achieve more walkable, complete communities envisaged in Cochin to Grow initiative, transit must be supported by appropriate land use planning and design, including a vibrant public realm with a concentration or density of activities (e.g. jobs, shops, schools, and recreation) within convenient access by walking, cycling and transit. The creation of a network of successful mobility hubs is central to the VMH as one of the ways to achieve this connection between land use structure and transportation investment. Mobility hubs are the point of contact not only between transit lines, but between transit and the surrounding city. Well-designed stations must make both the transfer between transit modes as seamless as possible and the relation to the urban context as convenient as possible. A mobility hub is the core not only to the development, uses and activities around it, but also to the supporting networks of local transit service, and biking and walking trails that connect it to its catchment area. The success of a strategy for implementing mobility hubs can be assessed against the following objectives, organized by the three lenses of the VMH – people, the environment and the economy. 1. Create attractive, pedestrian-friendly, convenient places around stations which combine opportunities for living, working, education, shopping and recreation by promoting well-designed, mixed-use, intensive development. 2. Maximize the convenience, comfort and enjoyment of the transit experience by improvements to the stations, their environment and the connectivity between modes. 3. Improve the attractiveness and safety of walking and cycling, within and to mobility hubs. 4. Reduce the amount of time spent travelling to work and school by providing optimal live/work opportunities. 1. Improve air quality by reducing the reliance on automobiles and by prioritizing walking, cycling and local transit networks. 2. Regenerate the natural and built environment around stations by reducing surface parking areas and related surface run-off and heat gain, and by encouraging ‘green’ building and development. 3. Reduce external trip generation by promoting a diverse, intensive mix of uses within mobility hubs. 4. Promote the most sustainable urban structure by reducing pressure for urban sprawl by focusing future growth in mobility hubs. 5. Showcase planning and design that account for interactions between air, land and water systems, living organisms, built structures, and the effects of human activity. 1. Foster concentrations of employment by providing attractive, competitive locations around convenient and accessible places. 2. Easily connect people and jobs by providing concentrations of housing and employment near transit stations. 3. Reduce wasted time and expense on congested roads and highways by providing alternative means of transportation. 4. Improve economic productivity by encouraging more creative, dynamic, and collaborative clusters in mixed-use office districts. 5. Enhance land values in vibrant downtowns with more valuable long-term investment sites. 6. Support tourism activities by providing ready access to services and attractions. 7. Promote the most efficient use of infrastructure. 8. Create a financial synergy between transit infrastructure and development: one provides incentives for the other.